The global Food inclusion Market recorded revenue of $10,068 million in 2017 is estimated to grow at a CAGR of more than 7.5% during the forecast period 2018 to 2023. 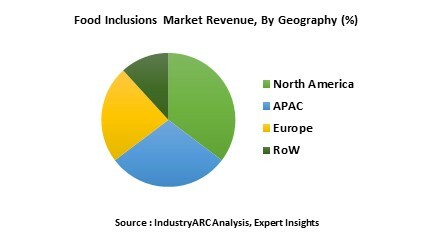 Food inclusion market is one of the fastest growing segments in food & beverage industry. Asia-pacific is the most dominant market for food with a revenue of $3541 million in 2017. China, japan and India are the major contributors for the food inclusion market in the region. In application type, food inclusions are majorly used in snacks application and food inclusion in this application generated revenue of $2,602mn followed by bakery & confectionary application which had generated more than 2093mn in 2017. Food inclusions are put on to the food products to enhance the texture, flavor and visual appearance. They vary in shape, texture, color, size, shape, taste and are available in different forms like solid, semi-solid and liquid states to meet the requirements of various applications. Some widely used food inclusions are wafers, dry fruits, jellies, flakes, nuts etc. Food inclusions are available in different flavors to add variety of tastes to the food stuff; most used flavors include caramel, chocolate, fruit flavors, honey, dairy flavors etc. What are the major applications for food inclusions? Increasing demand for specialty food and expanding choices of consumer taste has kept the continuous challenge in front of the food producers to produce food with different taste. The characteristics of food inclusion vary according to the different application such as beverage, confectionary, bakery, snacks, dairy, frozen food & others. Food inclusions like nuts, seeds, whole grains, vegetables, fruits, fiber are used to bakery food items such as breads, cakes & biscuits. There is high penetration level of packaged food and considerably demand for specialty foods. Snacks are the major application for this market as huge varieties of inclusions are used in different product lines. European customers progressively compare products which is in high-quality with admissible production. Recently, Mondelez International has stated that its intention in expanding the permanent wheat sourcing initiative, to embrace 100 percent of its biscuit brand market in the EU by 2022, from its current market share of 60 percent during last year. It is expected that Mondelez would become the market leader in European Union by 2022. Nestle has taken initiatives to be powerful in its R&D operations in Switzerland. Nestle decided to merge two of its discrete scientific operation centers, Nestle Research center Nestle Institute of Health science as a single entity, Nestle Research. This Research center will focus on Food safety and analytical science, Material Science, and Health Science. The insights provided by the research center will be add as an innovative ingredient for business growth. France is the region where food and beverage has high level diversification market due to their demand in ingredient’s in the food items. Algaia, who is the major player of seafood ingredients is in an intention to expand its operation with its new investment of 4 million Euro in this fiscal year. This initiative has been strategized keeping the demand for sea foods in the France. It is expected that this investment would accelerate the business growth of Algaia and to be on the major market holder in near future. Who are the Major Players in food inclusion market? The companies referred in the market research report includes Cargill Inc., ADM Company, Sensory effects flavor company, Archer Daniels, Midland Company, Barry callebaut, Taura, Diana, Nimbus food Ltd and more.